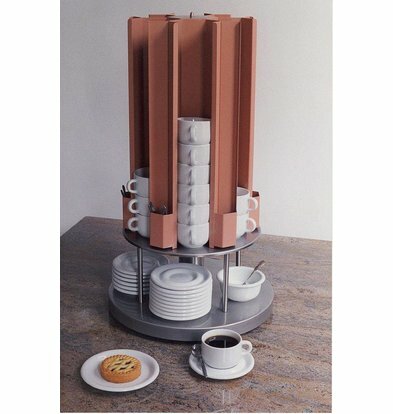 A beautifully designed carousel with appropriate compartments for standard catering cups including integrated spoon holders, this cup heaters Mobile Containing have a robust finished lower target for placement of its saucers. Each cup heater carousel is available in RAL 7035 (light gray) and RAL 9005 (black) and features smooth pulleys so that the stainless steel disc under the cup heater is easy to turn around. Want to know which cups fit this cup heaters Mobile Containing? Contact XXLhoreca 075-6151433 during office hours or send an Email to info@xxlhoreca.com .